Three years after the events of the rapturously-received original District 13 film, nothing much has changed in this crime-torn suburb on the outskirts of Paris. 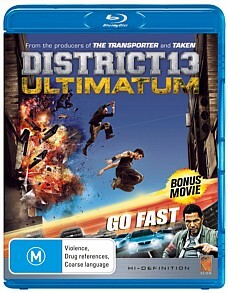 Once again based on a screenplay by French filmmaker Luc Besson (The Fifth Element, Léon), this action-packed follow up sees parkour pioneer David Belle and martial arts master Cyril Raffaelli reprising their roles as Leito and Damien respectively, as determined as ever to instil some order into the lawless confines of District 13, the ravaged, walled urban sprawl controlled by warring drug lords and a hotbed of all manner of nefarious activities. This sequel doesn’t feature the incredibly acrobatic stunts of its original as prominently, not is it quite as cogent or compelling. Belle and Raffaelli are predictably excellent, however, and the film does contain a subtle undercurrent of humour and no shortage of chase scenes and adrenaline-fuelled action sequences. Fans of the original won’t be disappointed, and ultimately Ultimatum both works well in its own right and brings the story arc to a fitting and satisfying conclusion. Icon have made the decision to release the film as a double feature, pairing it with little-known 2008 action flick Go Fast. Both titles appear on the same disc, which is currently retailing for around $30 - $35. Now, I must confess to not having particularly high hopes for Go Fast. Though it’s been referred to, not unkindly, as Paris in 60 Seconds, the first three reviews on IMDb are headed ‘Disappointing French action thriller’, ‘Speeding through all the usual cliches’ and ‘Boring car movie with not a lot of cars.’ Like the first two District 13 films it was helmed by Besson’s production company, though this one wasn’t penned by the award-winning auteur. Go Fast is a drug flick that revolves around the importation of hash from Northern Africa to Europe via the most expedient means available, which in this case seems to be a series of speedboats. Malek, a cop whose partner and best friend was killed by drug traffickers, sets up an underground task force charged with breaking up the smuggling ring and bringing the scoundrels involved to justice. The film boasts an awesome soundtrack courtesy of the likes of DJ Agoria and the action sequences are typically frenetic, though in spite of the title the film’s pacing lags towards the middle and the characterisations, or lack thereof, are also something of a letdown. Still, both films contain some impressive cinematography and numerous strong performances. This is an enjoyable and accomplished action double-header, which in addition to a pulsating surround audio mix also features a first rate 1080p HD transfer. Fans of the original District 13, in particular, will find plenty of familiar cinematic terrain, and action fans in general likewise won’t be disappointed.